I arrived home from Nice last night and thought it would be a nice idea to put together all my suggestions about what to do there in one convenient post. Of course, one can only do so much in a 5-night stay and thus the suggestions are limited, obviously subjective because they’re based on my preferences, and can only really be a starting point if you’re planning a trip to Nice. But if you are – and if you’re not do think about it! – hopefully the following will give you a good start. I flew with British Airways and used some air miles I had to pay for the flight, but I always find their prices very competitive and living near Heathrow and just a 490 bus ride away from their home at Terminal 5, it’s a very easy option for me; they’re always my preferred airline (no horrid hidden costs!). Once at Nice airport it’s incredibly quick and easy to get to the centre by the 98 bus which services both Terminal 1 and 2. The airport lies at one end of the 4km Promenade des Anglais and the 98 bus follows the coast road so is a pretty ride too and costs just €6. The journey to the heart of Nice, near the Old Town, takes only about 15-20 minutes. 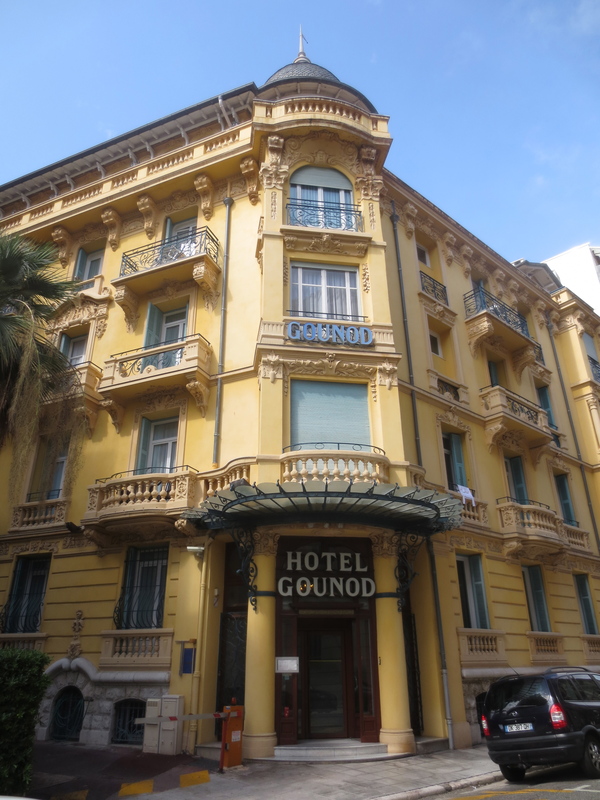 I stayed at the 3* Hotel Gounod. 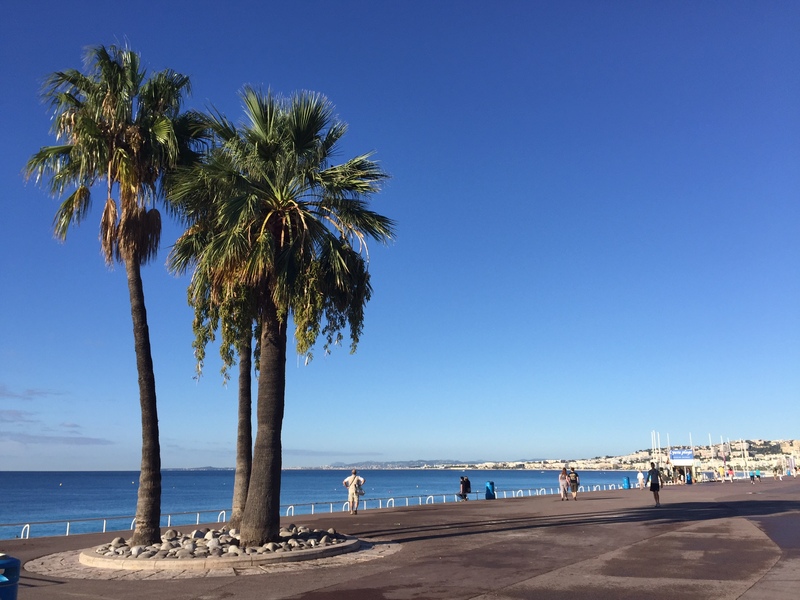 I booked this through BA and it was very conveniently situated just off the Promenade des Anglais and about a 20-minute walk to Cours Saleya and the Old Town. It’s a pretty 1920 building of the Belle Epoque style. The inside is rather faded, however. My room unfortunately had a window opening onto a narrow interior ‘courtyard’ which was ugly and the room had little natural light. There was no minibar or safe and the free wifi’s efficiency was variable depending on what time of day you wanted to use it. The people were quite friendly but didn’t particularly engage. I asked if they could recommend a typical Niçoise restaurant they might go to rather than the touristy ones but only got directions to perhaps the most touristy area in town! Some engagement is important for the single traveller – as I found at Hotel Mocenigo in Venice, or at Hotel Porta Mamolo in Bologna, where people in reception would ask me about my plans, my day and be ready to give tips of things I might like to do. So, Hotel Gounod was OK; not actually bad – it was perfectly clean, the bed comfortable etc. – but not somewhere I’d automatically return to on my next trip to Nice. Really I just want to point out the importance of location here. 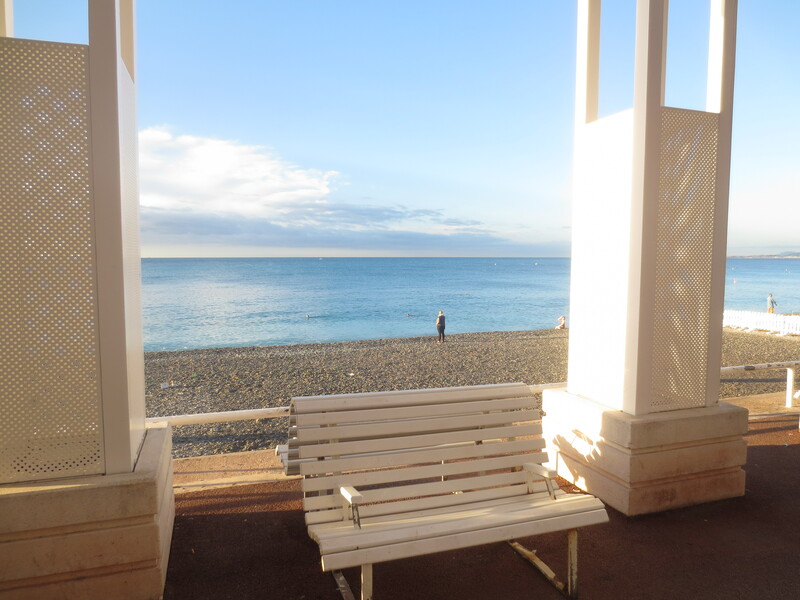 As the Promenade des Anglais is so long at 4km, being near it isn’t necessarily a guarantee of being close to where you’re most likely to spend your time. 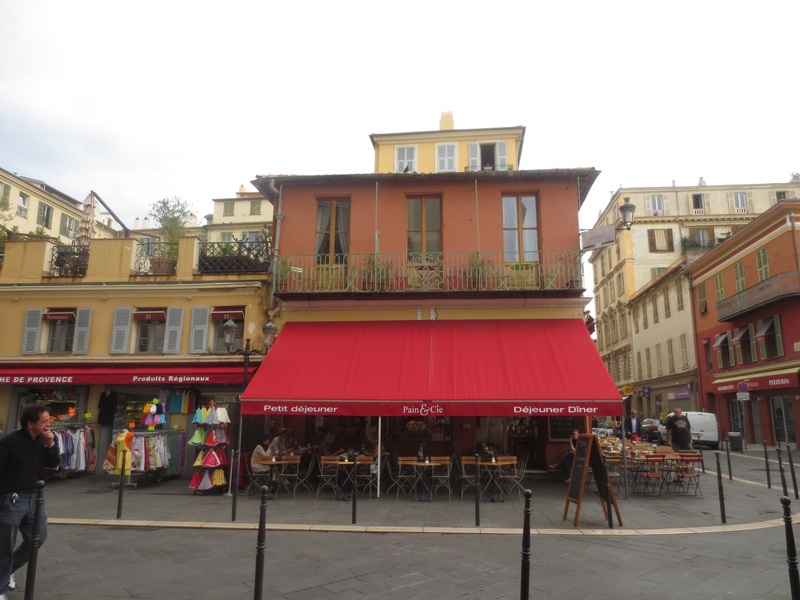 You’ll probably – like me – want to be near the Old Town so check the distance to Vieux Nice and Cours Saleya and that it’s walkable. Breakfast wasn’t included in my hotel deal (though available for €14) so I always went out. I prefer that anyway – to find a nice local café. I’m not a cooked breakfast person and only want a continental breakfast. Pain & Cie at one end of Cours Saleya was a café I knew as a Pain Quotidien the last time I was in Nice. Although the name had changed everything else – the decor, the menu, the food – was just like a Pain Quotidien. Their Continental Breakfast of freshly squeezed orange juice, a generous bread basket, croissant and coffee or tea wasn’t cheap at €10.50 compared to other cafes but excellent. I ended up going there each morning, enjoying the walk along the Promenade early before it was too crowded and then watching the stallholders set up in the market in Cours Saleya as I ate breakfast. 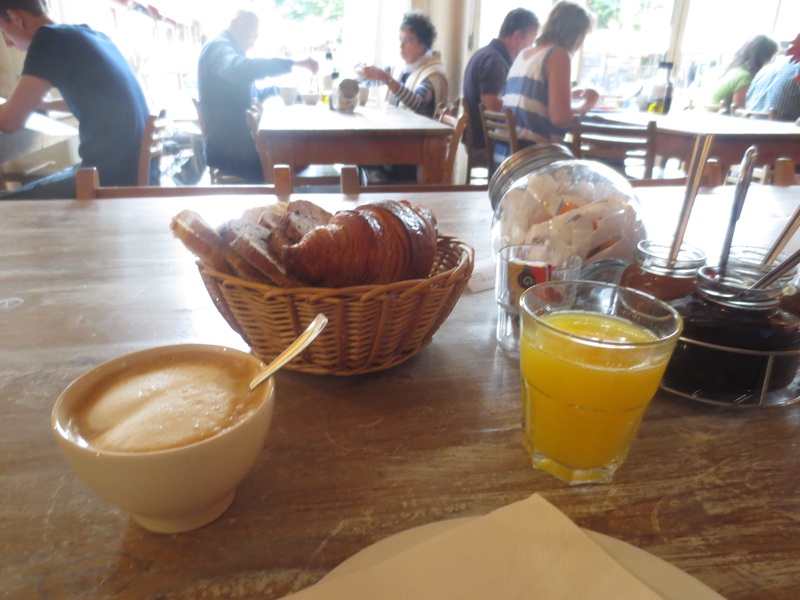 I found that generally coffee wasn’t great anywhere – I am so used to my artisan coffee in London – and Pain & Cie’s was OK but on the last day I found the best café au lait of the trip at Bar Lou Pastrouil on Rue de la Préfecture by Place du Palais. 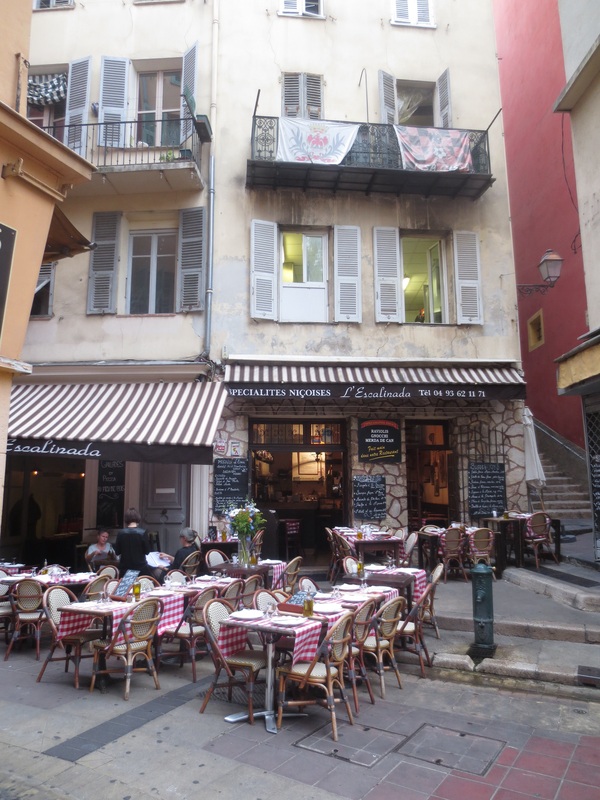 Nice is a fantastic place to snack (I always prefer to snack at lunchtime and eat a main meal in the evening). Some of their most famous traditional dishes are made for snacking: socca (a kind of pancake made from chickpea flour), petit farcies (small stuffed vegetables), pissaladière (gorgeous onion tart topped with olives and anchovies). 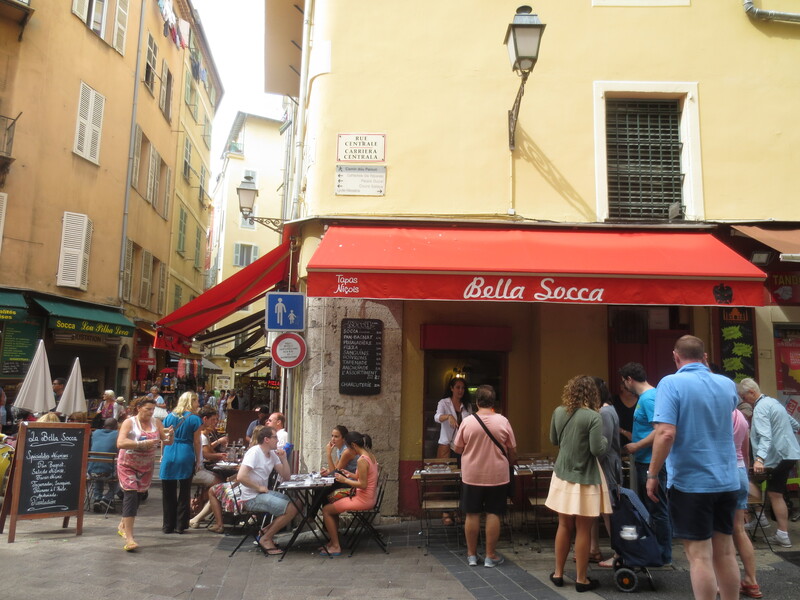 I loved the food at Bella Socca (13 rue du Collet) which does all the traditional Niçoise snacks. I had a Salade Niçoise at Le Safari in Cours Saleya, which was in my guide books. It was OK but a little touristy. 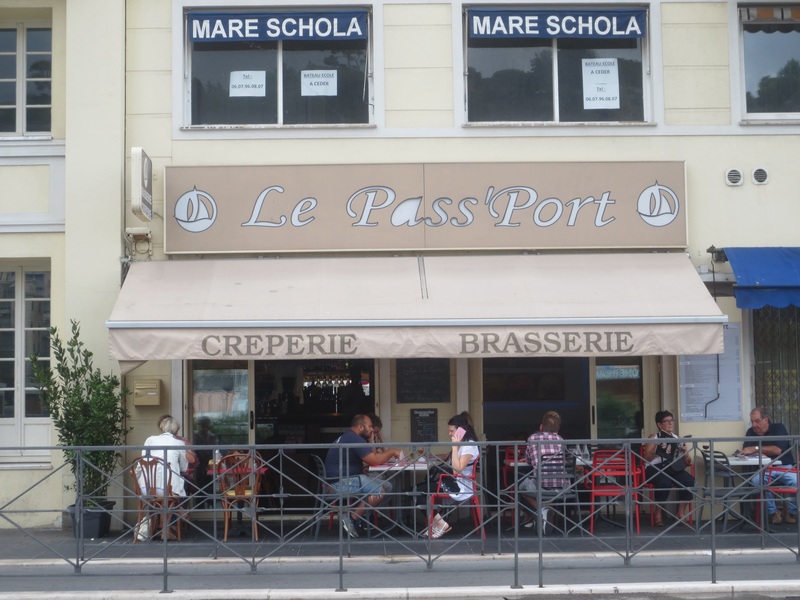 One day I had a good ratatouille at a simple brasserie – Le Pass’Port at 8 Quai des Docks – overlooking the port; they also did crêpes. 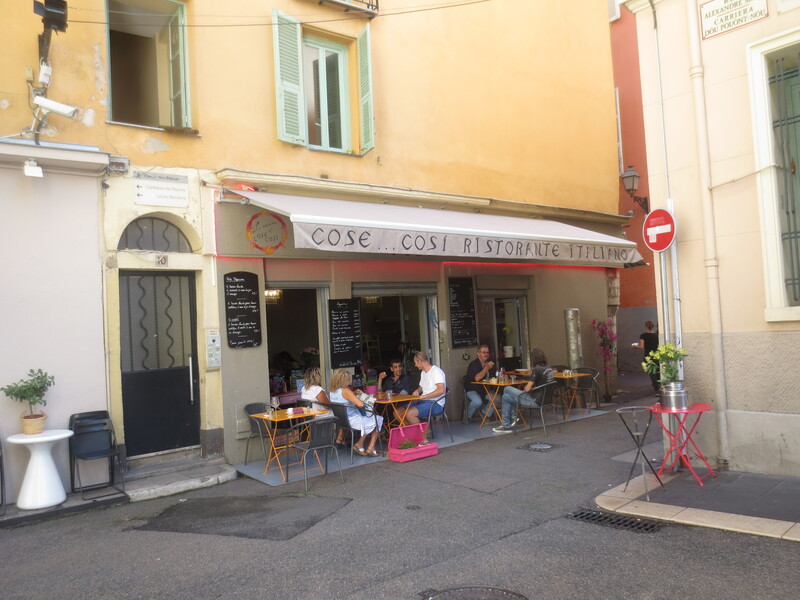 On my last day – when I was flying home in the evening and wanted something reasonably substantial – I had a lovely pasta dish at Cose Cosi, a small Italian place in Rue Saint Gaetan. 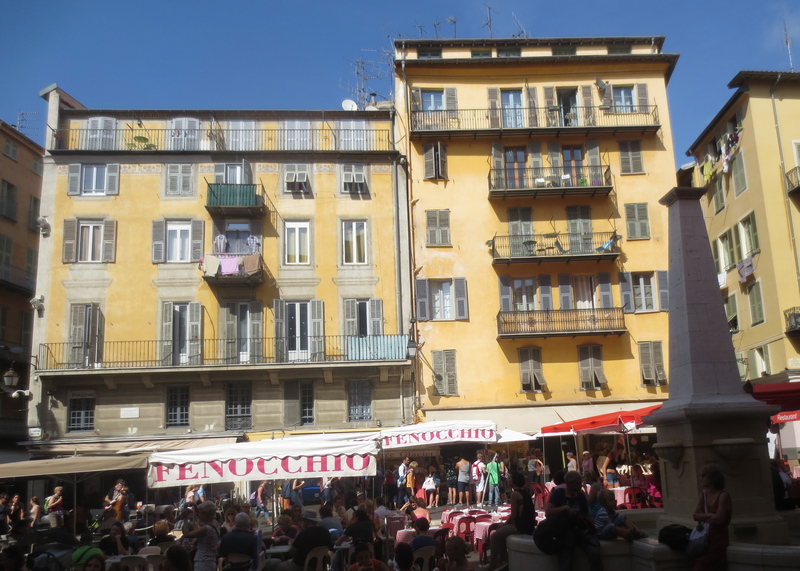 Nice is so close to Italy, and indeed was part of Italy until 1860, that you will find a lot of Italian food and restaurants. The local Niçoise dialect is a cross between French and Italian and some of the food makes this crossover too. 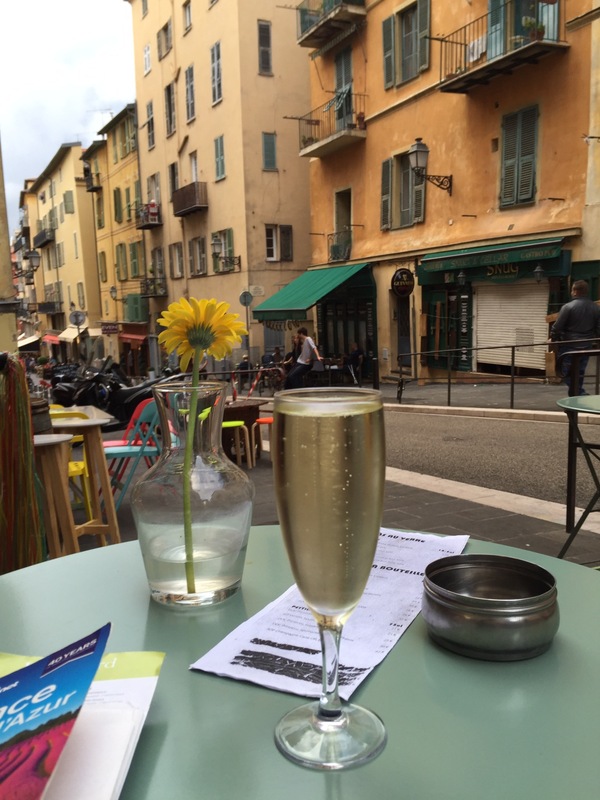 When I’m on my own I tend to just order an aperitif in a restaurant to drink while I choose my food but if you like bars there are lots to choose from in Nice as people sit – even in the morning! – drinking Provençal rosé wine, beer or Aperol spritzers. 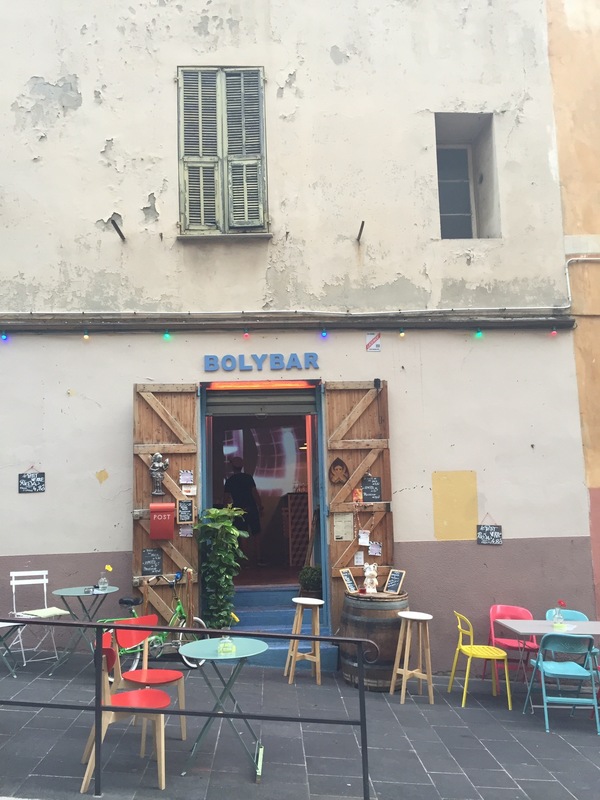 I’m not keen on noisy bars but found this lovely little one – BolyBar – just up rue Rossetti with Place Rossetti in sight but away from the crowds. A good size glass of prosecco was just €3.50 and came with some nibbles of tortilla chips and dip. It was nice place to sit for a while, sipping my fizz, early evening before going in search of food. I was very much on the lookout for typical Niçoise food. 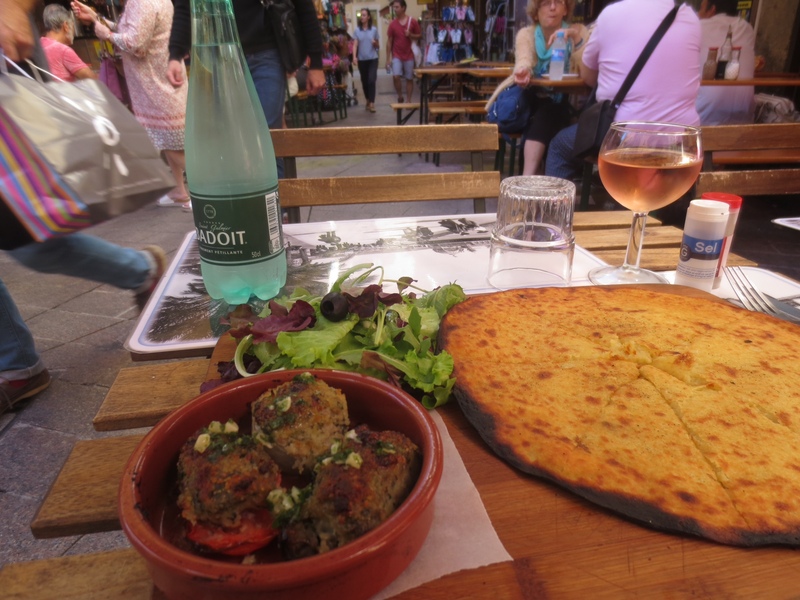 When I was in Aix-en-Provence a couple of years ago, I was hugely disappointed to find it almost impossible to find local Provençal dishes. 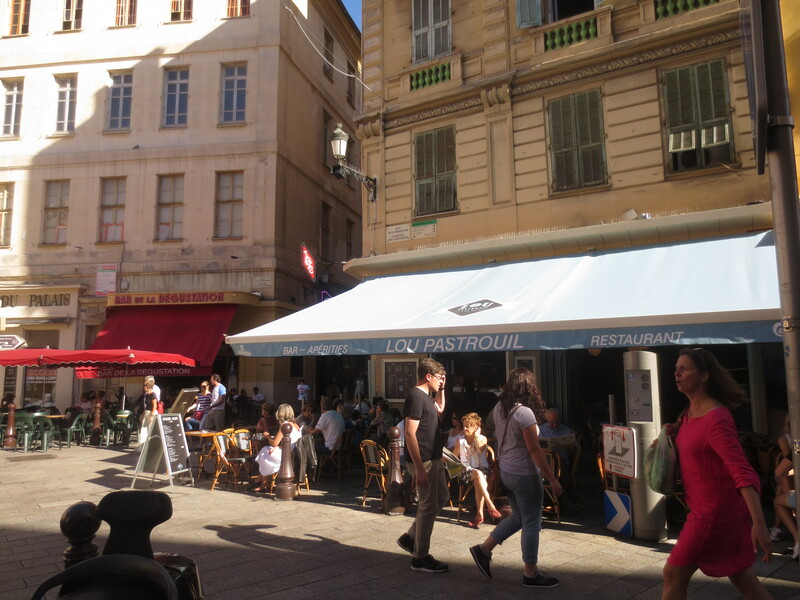 In Nice it was wonderful that I could sit down and enjoy something as simple as some socca or pissaladière at lunchtime and some Niçoise food in the evening too, although many restaurants offer more traditional French dishes. 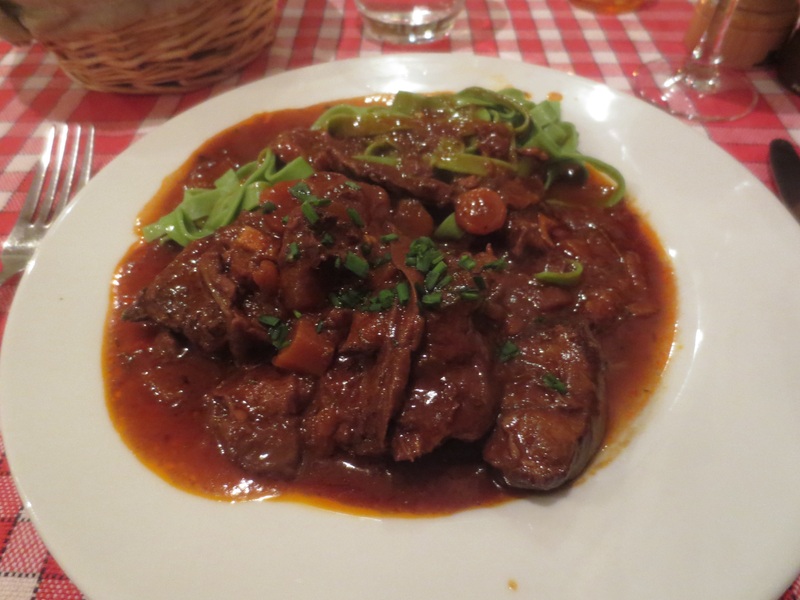 The first night I went to L’Escalinada (22 rue Pairolière)which was highly recommended by Lonely Planet and ate a simple meal of petit farcies. It was a nice meal and I was given a welcome of complimentary kir and some pissaladière. I was happy with it on my first night, a little tired from travelling, and the service was nice and friendly, but it wasn’t an exceptional meal. 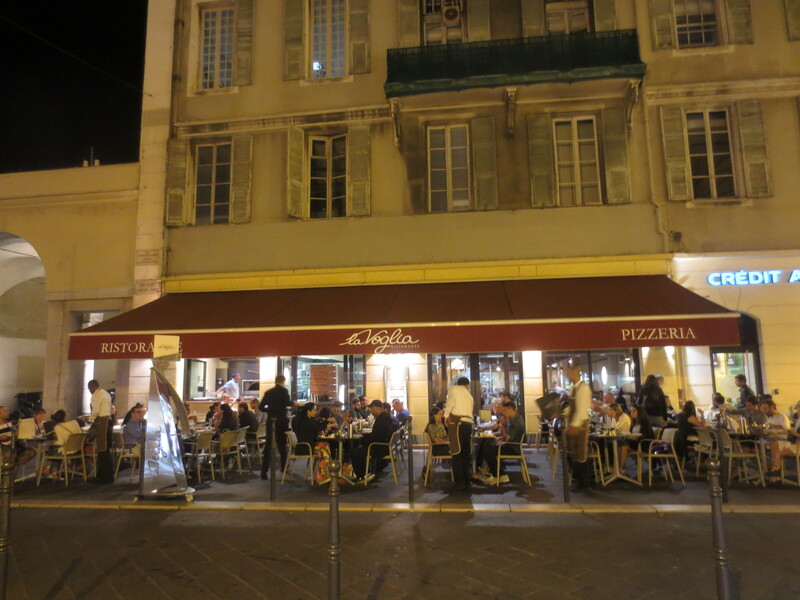 The following evening I went to La Voglia, an Italian restaurant on Cours Saleya. This had been recommended on a food tour I did (see below) and, as said above, there’s a lot of good Italian food in Nice. By chance I met three Canadian women who’d been on the tour and joined them, which was great. 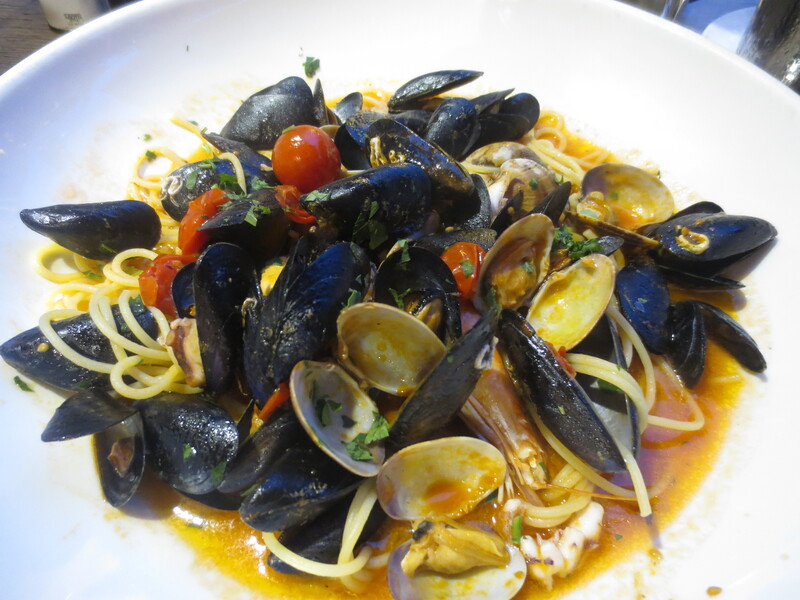 I had an excellent seafood pasta – a huge portion which I couldn’t finish! 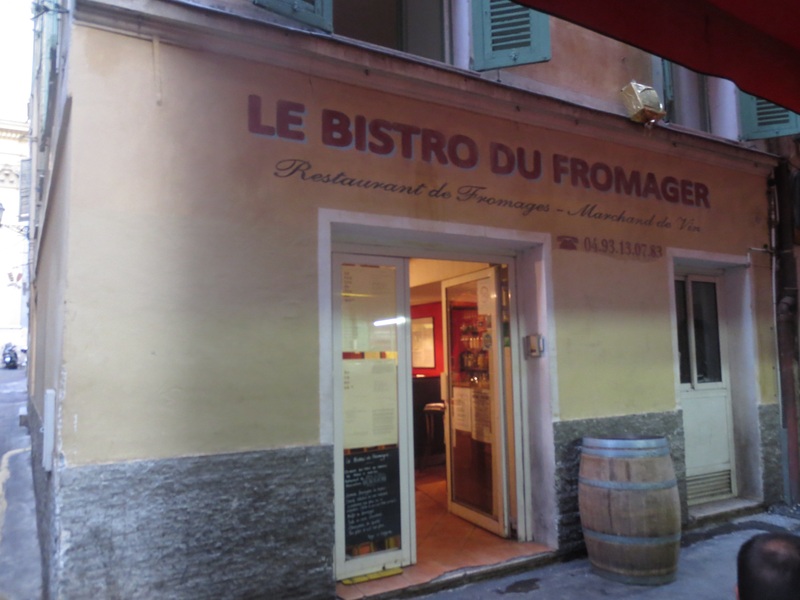 The next night I discovered Le Bistro du Fromager at 29 rue Benoît Bunico. Again recommended by the tour guide Megan as her favourite restaurant, this didn’t fit my ‘eating local food’ intention at all and, as the name suggests, the menu was heavily based on cheese dishes – so if you don’t like cheese, you probably won’t want to go! However, I loved the place. I had a great meal (read earlier post) and the inside, just like a wine bar in a wine cellar, was the kind of friendly, informal place I like best. The service was wonderful: friendly, very efficient and informative. The food was great and I booked immediately for my last night. 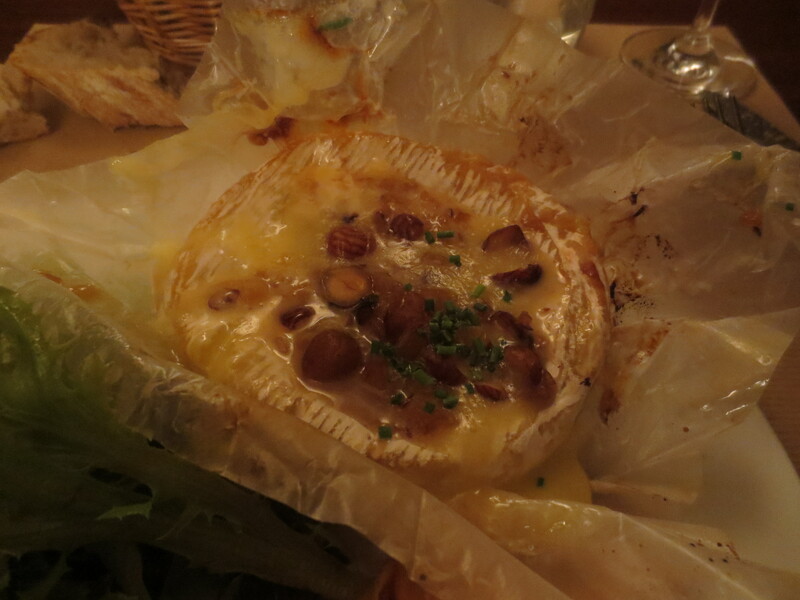 I’d not had cheese the first time but the second time had a gorgeous baked Camembert with honey and hazelnuts. It was really really good and a bit like my own little fondue; piping hot, gorgeously gooey. It came with crisp roasted potato slices that I dipped into the hot melted cheese, a basket of their brilliant bread, which I also used for dipping, and a green salad. I’ll definitely be going here again when I’m next in Nice. 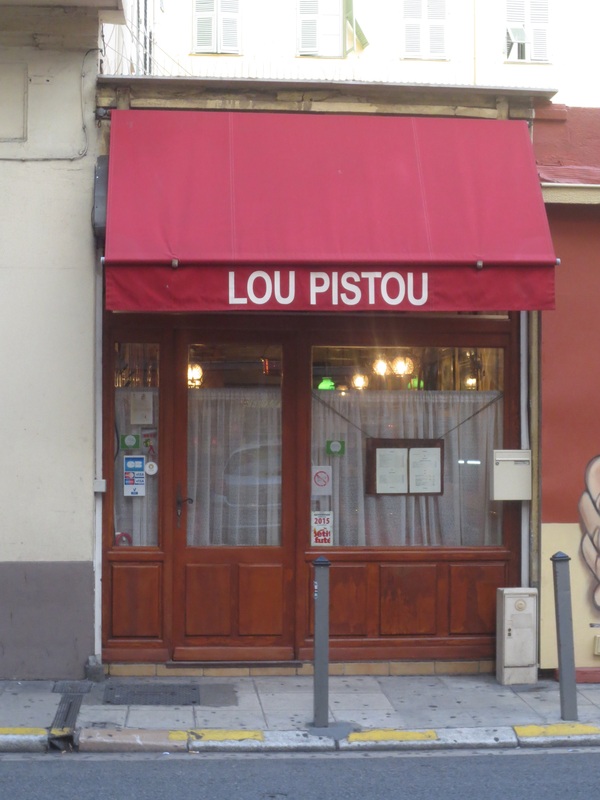 Lou Pistou was a chance find; a place I’d looked at and then finally just went into one evening (see full review here). This satisfied my desire to experience good local Niçoise food as I had a brilliant Daube de Boeuf here. Being so close to Italy it’s not surprising that there are a lot of good gelaterias in Nice. In Place Rossetti you’ll find Fenocchio which is in the guide books, sells gelati with flavours like black olive and tomato & basil. I went for the more conventional rhubarb and it was very good. 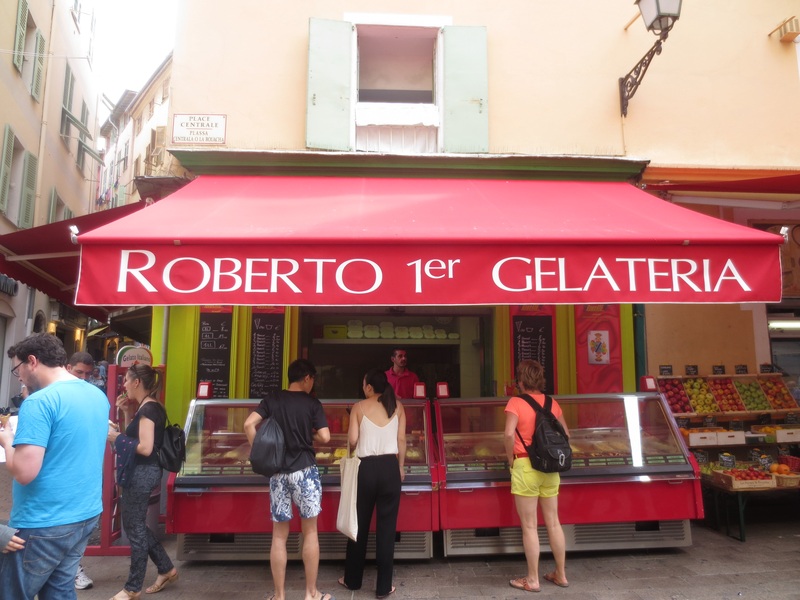 The next day I was introduced to Roberto 1er by the food tour guide and this was truly excellent gelato. You’ll find them at 2 Place Centrale and also 10 rue du Marché. They make their own waffles cones too which you can see them doing at the rear of the gelateria. 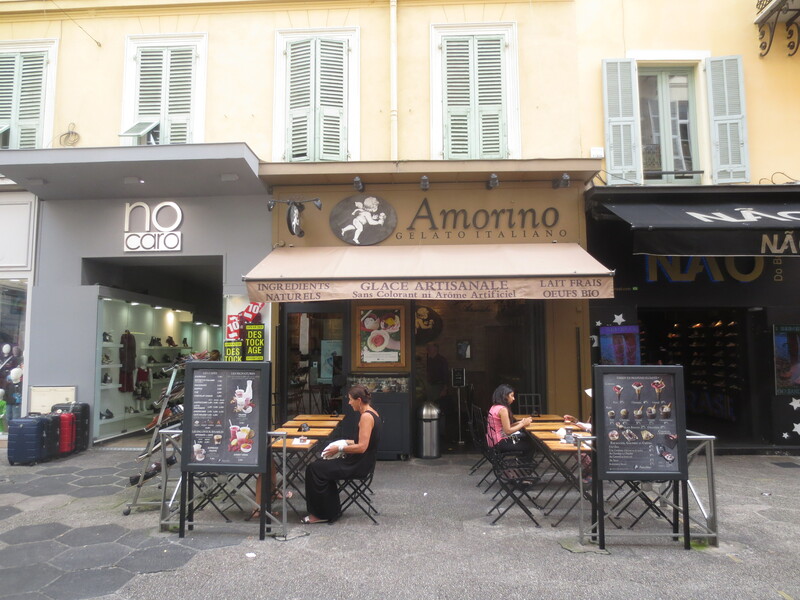 I had another ice cream one day at Amorino which is a chain of artisanal gelateria but serving good gelato. You’ll find one at 33 rue Massena. A bonus is they have seats outside if you want to sit down. 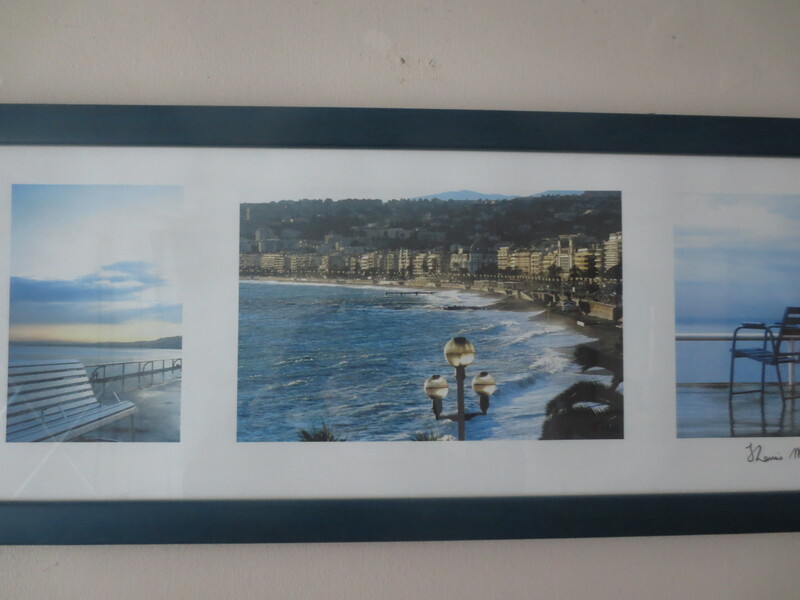 It had been 9 years since my last visit to Nice and that time I brought back a frame of three wonderful photos by local photographer, Jean-Louis Martinetti. That picture is still on one of my walls! I was delighted to find his shop again at 17 rue de la Prefecture and bought postcards there. 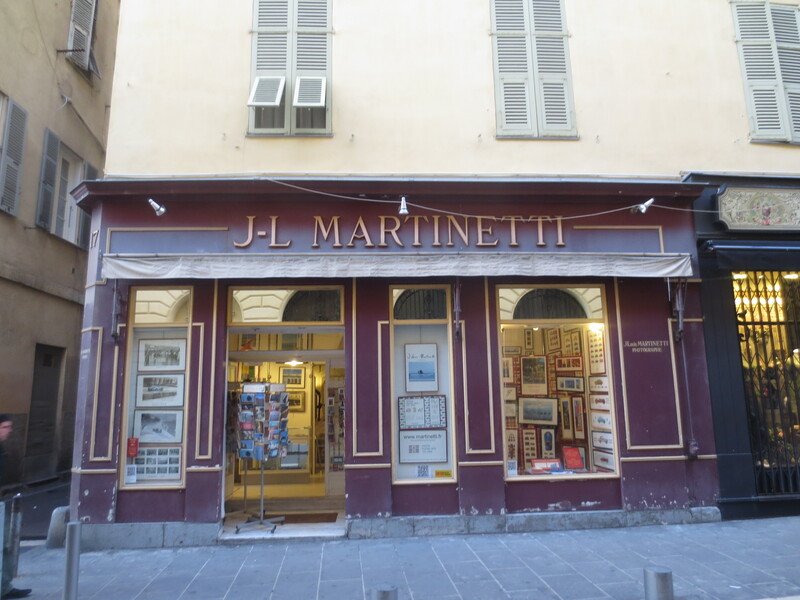 I had a chat with Monsieur Martinetti too, who told me about good local places to eat. Unfortunately it was the last morning so I promised that next time I’m in Nice I’ll go back to him at the beginning for some suggestions. Take a look at his website: www.martinetti.fr. If you’re ever in Nice, these are the photos you’ll want to bring back home. Well of course the first thing you must do is take a walk along the legendary Promenade des Anglais. 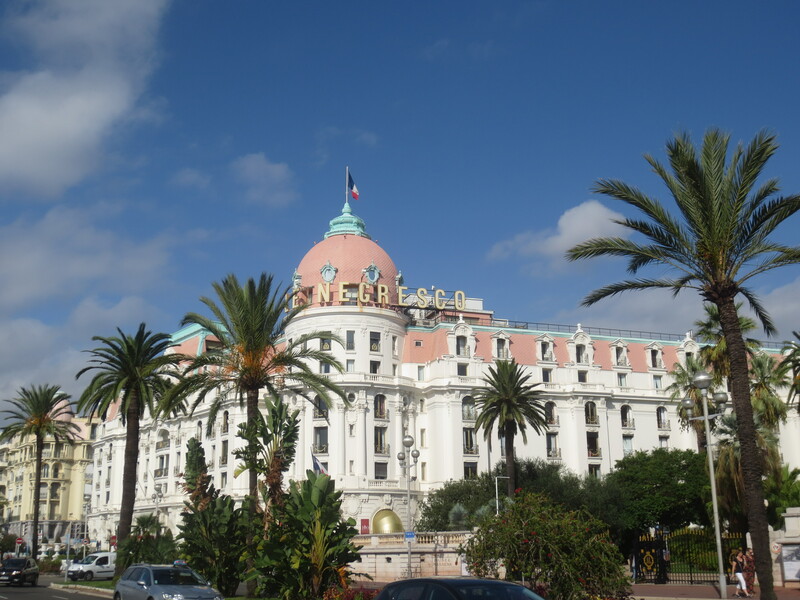 It epitomises Nice’s elegance with its palm trees and fabulous hotels, most notably the Hotel Negresco. Nice was a poor town before the English came in the late 19th century seeking its health benefits, due to its mild climate with little rain. It was a favourite haunt of Queen Victoria. The beautiful sweeping bay has been celebrated in the joyful paintings of Raoul Dufy and if you want to see some of his paintings, go along to the Musée des Beaux Arts (see this post). Another iconic thing to see on the Promenade are the blue chairs. They first appeared in 1900; the current ones date from 1997. They are painted blue to reflect the blue of the Mediterranean in the Baie des Anges (Bay of Angels). Two rows back onto each other. You can either look out to sea or at the Promenade. They’re free to sit on. You’ll also find very comfortable benches in the arches of the white pergolas, also backing on to each other with a choice of views. 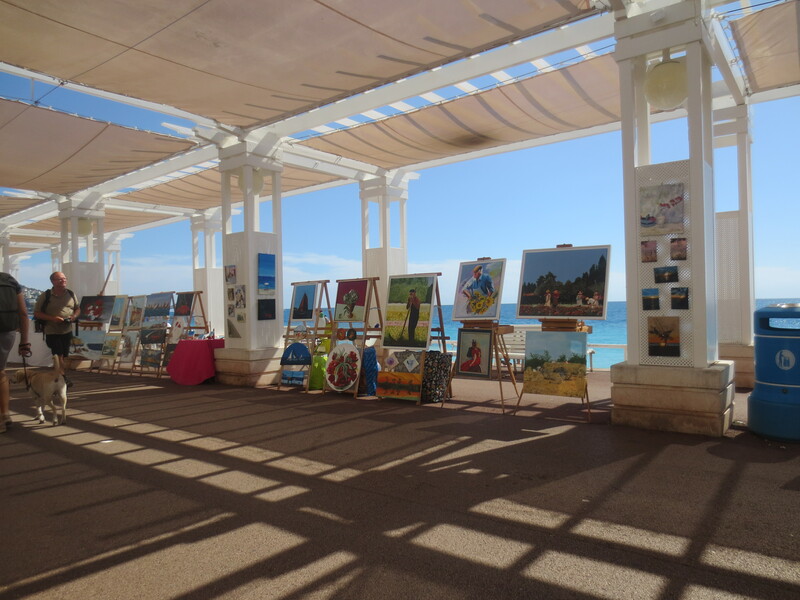 On Saturday morning the pergolas filled up with artists selling their paintings. 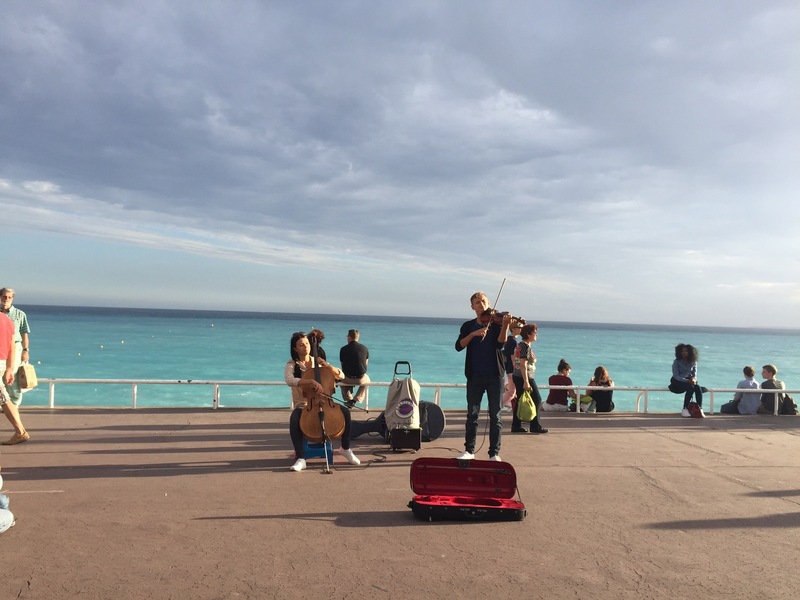 In the evening you might buskers along the Promenade, like these two young musicians playing their cello and violin. The photo above is from my 2006 visit to Nice with my daughter Nicola – and that’s her standing under an olive tree right outside the Musée Matisse. I didn’t visit this time but it should definitely be on your list of places to see. It’s located 2km north of the centre in Cimiez. The place I did get to is Villefrance-sur-Mer. I’d planned to visit this pretty village before arriving in Nice and when the weather turned cloudy and rain forecast over two days, I almost didn’t go. I’m so glad I did and it’s really just a very short journey by bus 100 from the Port; costs only €1.50 and takes only about 10 minutes to get there, giving you a great view of the magnificent coast along the way. I’d also planned to go to Èze which is a little village in the hills with apparently marvellous views, but I didn’t make it in the end. 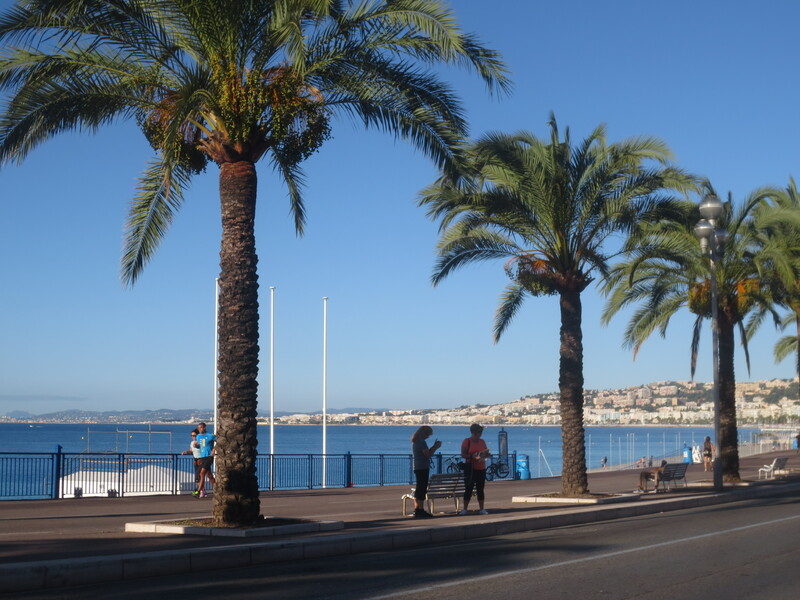 I felt it would be best to go on a truly sunny day if I was to enjoy views but when the sun finally arrived in full splendour at the end of my trip, I didn’t want to go anywhere other than the Promenade des Anglais and enjoy the view there. 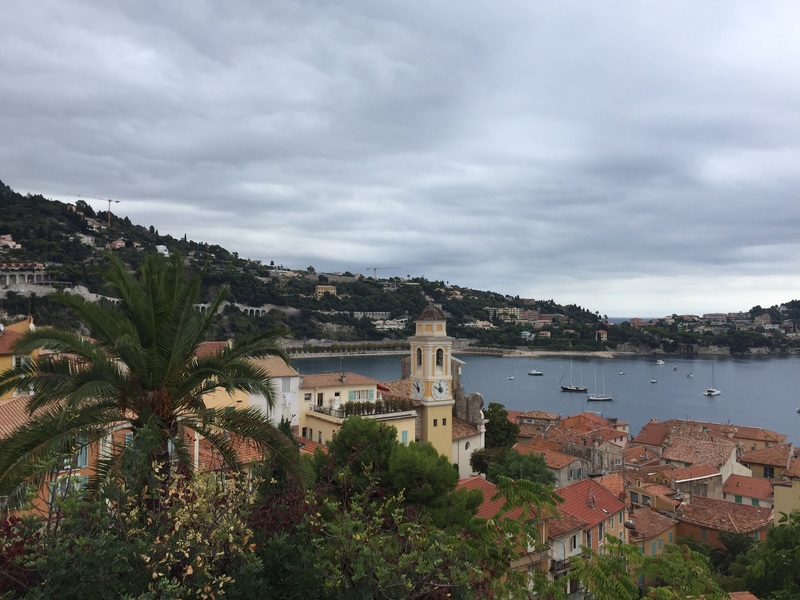 For the more adventurous, or if your stay is longer, it’s easy to get to places like Cannes, Antibes, Menton, Monaco and even into Italy by train or bus. 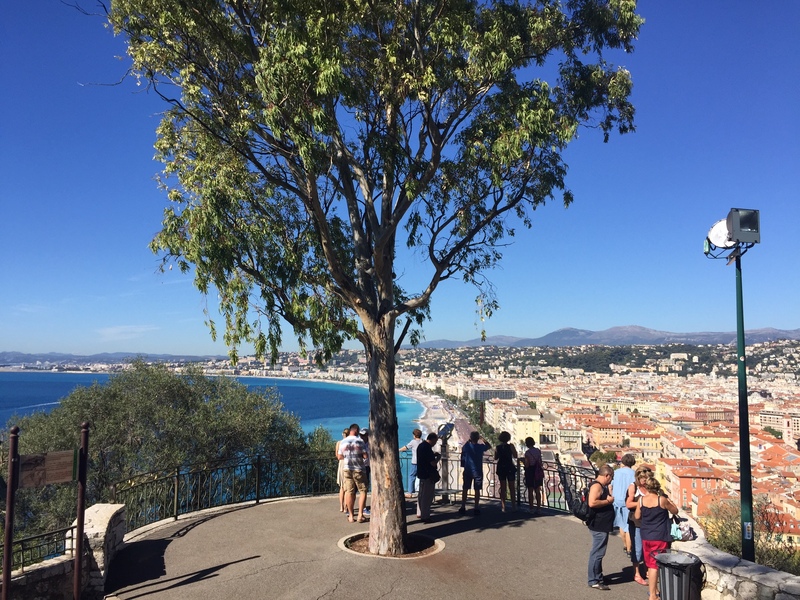 Whatever you do or don’t do, don’t miss the view from the 15th century Tour Bellanda at the top of Castle Hill for a fabulous view over Nice all the way along the Promenade des Anglais. I climbed this on the first day (there is a lift too) but when the sun eventually made an appearance on Friday I just had to go up there again. Foodies of course love food markets so you’ll want to head straight away to Cours Saleya‘s vegetable, fruit and flower market that’s held every day except Monday – when there’s an antiques market. There’s a fish market in Place Francois and I found a book and poster market in Place du Palais on Saturday morning. 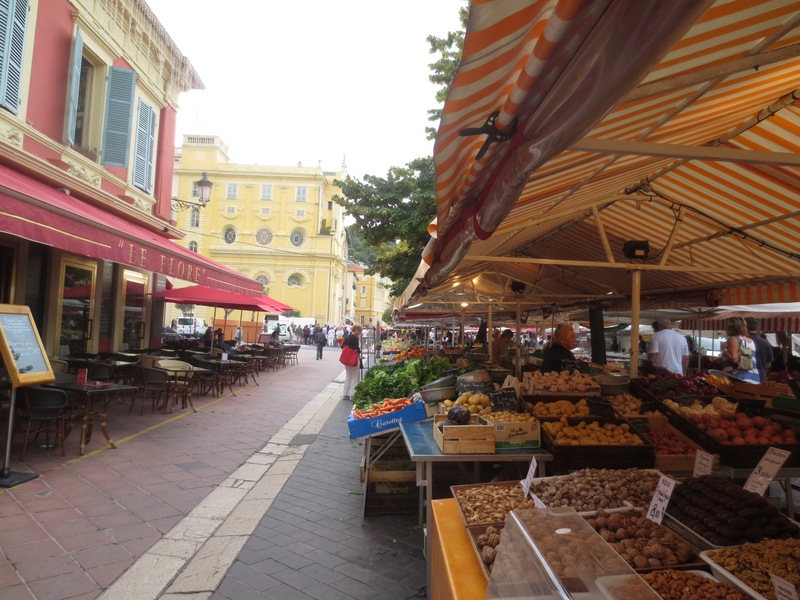 I did a great food tour with A Taste of Nice tours on my first morning. This of course is the best time to do it so you’re better informed about where to eat and food shop for the rest of your trip. It was also great fun. Not too big a group – just 12 of us – and a great guide in the form of Megan who really knew her stuff. That’s us near the end having lunch at Bella Socca. For more info read this post: click here. I could go on writing for a lot longer but I think that’s probably enough for one post! I really loved Nice and can’t understand why I waited 9 years to return. I shall definitely be going back soon. You can now download this article and others on Nice with GPSmyCity app. Great for when you’re exploring Nice. Click here for link. Thank you Kay for sharing your trip. I would love to go one of these days. Thank you Gerlinde. It’s a great pleasure to share! I hope you get there one day; I’m sure you’d love it. How useful! I was there just today eating ice cream from fenocchio. My first time and just 5 hours. Definitely one to return to. Just found your lovely blog. I, too, love Venice and I was intrigued by Nice. 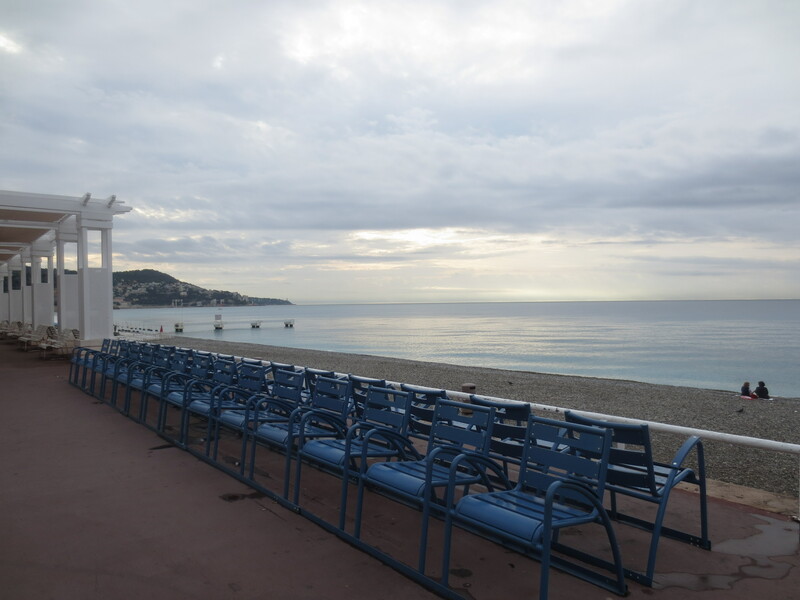 While there, in November 2014, I stayed at the Mercure on the Promenade des Anglais. The room was lovely… directly on the sea and a scrumptious breakfast was included in the room price. Should I return to Nice, I’ll be staying there again. The staff is very friendly also. As you say, it’s a must when you travel solo.